It may be football and hockey season now, but it’s already time to start thinking about the 2019 baseball season because we’ve developed and announced our line-up of adventures! Featuring classics like Windy City Plus and Central Express, our season next year will also hold some newer trip options such as Ocean, Desert, Mountains and a Major-Minor Northeast trip that will make a stop at our offices in Hatfield, Massachusetts. There are 18 travel packages in total next year, and they begin on June 6, 2019, and end with a trip that begins August 10, 2019. These treks will take baseball fans across the country for games, stadium tours, and sightseeing. Among the classic trips back by popular demand are the East Coast Classic, which includes four stadium tours and city tours of Boston, New York City, and Washington, D.C. View photographs, documents, and artifacts at the National Baseball Hall of Fame and Museum, check out the historic Liberty Bell in Philadelphia, and get up close to the action at six different games. 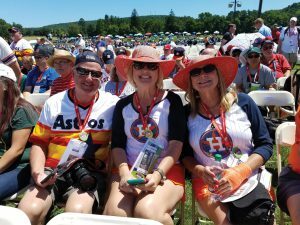 As always, Sports Travel and Tours is eager to help travelers make it to the annual Hall of Fame induction ceremony on July 21, 2019, as well as all the festivities that come with it, like the Parade of Legends through Cooperstown, New York, and the Legends of the Game Roundtable at Doubleday Field. The Induction Plus and Eastern Loop tour packages are your ticket there! The ever-popular Major Minor trip is back, too, but after a year spent exploring the West Coast, it’s coming to the Northeast, featuring stops in all six New England states to see six minor league games and one major league game at Fenway Stadium. New features include a visit to the elegant Newport Mansions, and a barbecue at our company’s home base in Hatfield, giving travelers a chance to put faces to the names and voices they’ve heard over the phone. A brand new trip that’s on the roster is Ocean, Desert, Mountains, which centers on Southern California cities along with Phoenix and Denver. Tour Dodger Stadium, baseball’s third-oldest stadium and one of the game’s most beautiful, plus explore San Diego’s Gaslamp Quarter and enjoy six games. Triple Play, featuring stops at Fenway Park, Yankee Stadium, and Citi Field, as well as two stadium tours. Stars and Stripes, which includes a Washington, D.C. city tour and a stop at the Babe Ruth Birthplace and Museum in Baltimore. Southerner, taking fans on a five-day getaway to Florida and Georgia’s baseball destinations. Southern Swing, adding four more days onto the shorter Southerner trip and taking guests to enjoy the sport and attractions deep in the heart of Texas. Texas Two Step, on which travelers can explore Houston, Texas, including the Space Center, and learn the history of the livestock industry at the Fort Worth Stockyards. Central Express, featuring seven games, time to check out the St. Louis Ballpark Village dining and entertainment district surrounding Busch Stadium, and a tour of historic Wrigley Field, home of the Chicago Cubs. Mid-Western, a shorter version of Central Express that ends with a game at Target Field in Minneapolis, Minnesota. Windy City Plus, a brief four-day jaunt centered around, of course, Chicago. Four Bagger, which includes tours of Baltimore’s Camden Yards and Babe Ruth Birthplace and Museum, plus a stop in Philadelphia, Pennsylvania, to see the Liberty Bell. SoCal, taking visitors to all three of Southern California’s stadiums—Petco Park, Angel Stadium, and Dodger Stadium. West Coast Classic, a 10-day excursion from San Diego up to Seattle that includes seven games and a tour of Los Angeles, California. Northerner, a shorter version of the West Coast Classic that starts in San Francisco and includes four games. And lastly, The Lakes, the only trip on the list that takes travelers to Toronto for a Blue Jays game at Rogers Centre, originally called the SkyDome.